EmTech happens at the MIT Media Lab in the heart of the MIT campus in Cambridge, MA. Here, you can’t help but feel the excitement and inspiration of being at the top university in the world, surrounded by the top technology minds anywhere. Anchoring the renowned University Park at MIT, Le Méridien Cambridge-MIT stands amidst an area legendary for its infrastructure of invention. 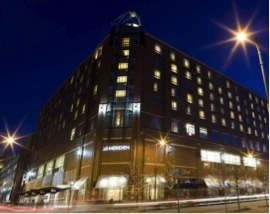 Situated in the heart of Central Square in Cambridge, the hotel is steps away from a culturally diverse area renowned for its cuisine and shopping, easily accessible from Logan Airport and just minutes from Boston city center. Le Méridien Cambridge-MIT's elegant guest rooms and suites offer a place of luxurious sanctuary and unmatched comfort. Group rate available until September 16, 2013. 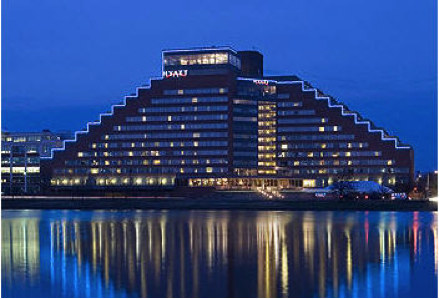 Hyatt Regency Cambridge is located along the scenic Charles River overlooking the Boston skyline and is in the midst of two uncommonly exciting cities, Boston and Cambridge. Discover Boston and Cambridge at a hotel just minutes from Boston, adjacent to MIT, Harvard and Boston Universities. The Hyatt's guests are greeted with a dynamic 16-story atrium lobby featuring 470 newly renovated guestrooms. Zephyr on the Charles is the hotel's full service restaurant featuring eclectic dining, extraordinary views and authentic service. Our state-of-the art Hyatt Stay Fit Health Club features a 75 ft heated indoor pool, eucalyptus sauna and steam room. Group rate available until September 17, 2013.